William Augustus Pulteney Dana (1826-1866) was my 4th great uncle, the eighth of the ten children of my 4th great grandparents William Pulteney Dana (1776-1861) and Charlotte Elizabeth Dana née Bailey (1795-1846). 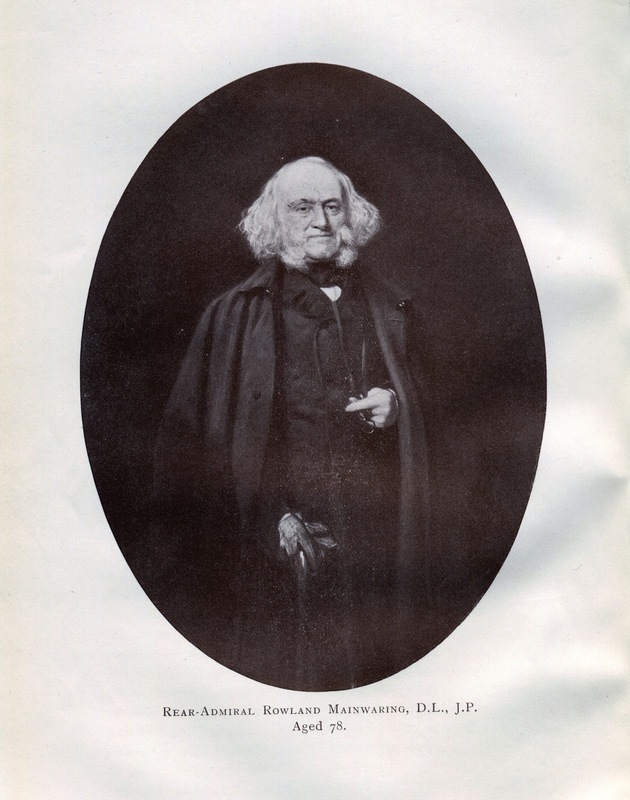 He was one of the brothers of my great great great grandmother Charlotte Frances Champion de Crespigny née Dana (1820-1904). 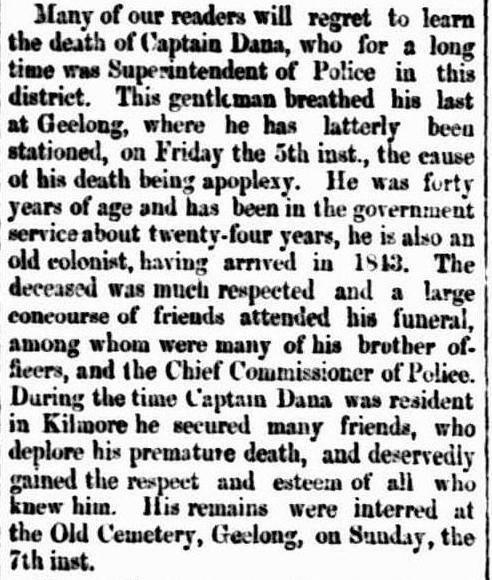 William, then superintendent of police at Geelong, died suddenly on 5 October 1866. 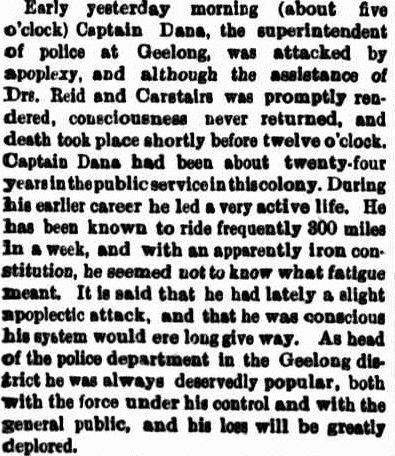 His funeral was reported in the Geelong Advertiser of 8 October 1866. Thousands of people, it was reported, viewed the long cortege. 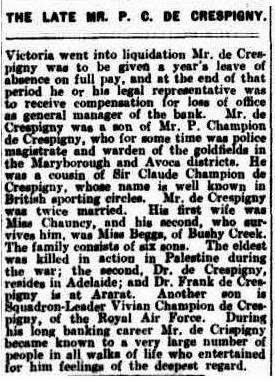 Philip de Crespigny, William Dana’s brother-in-law and my great great great grandfather was one of the principal mourners. Also among these principal mourners were his nephews, George and Augustus Dana. 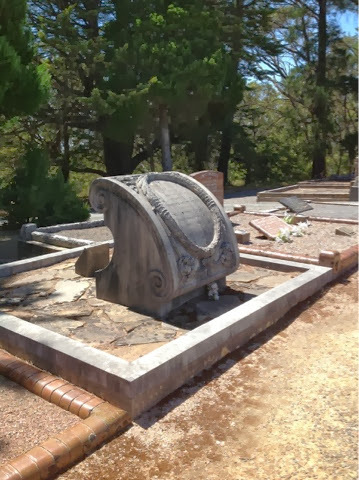 Images of Captain Dana’s grave in the Geelong cemetery at Find-A-Grave: http://www.findagrave.com/cgi-bin/fg.cgi?page=gr&GRid=163742121 These were kindly taken by Find A Grave contributor Ron M following my request to the site. William Robert Young (1876 – 1942) was the second youngest child of George Young (1826 – 1890) and Caroline Young née Clarke (1835 – 1879). William married Julia Kenny (1871-1950) in 1916. They had no children. 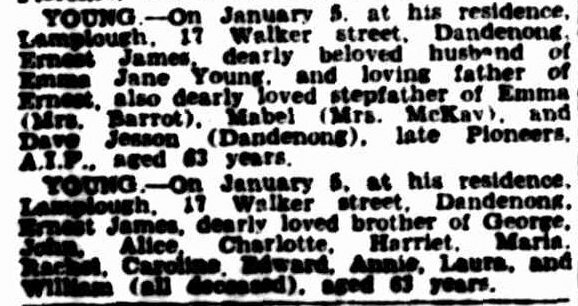 He died on 3 January 1942 at Warburton, Victoria, two days before his younger brother Ernest. 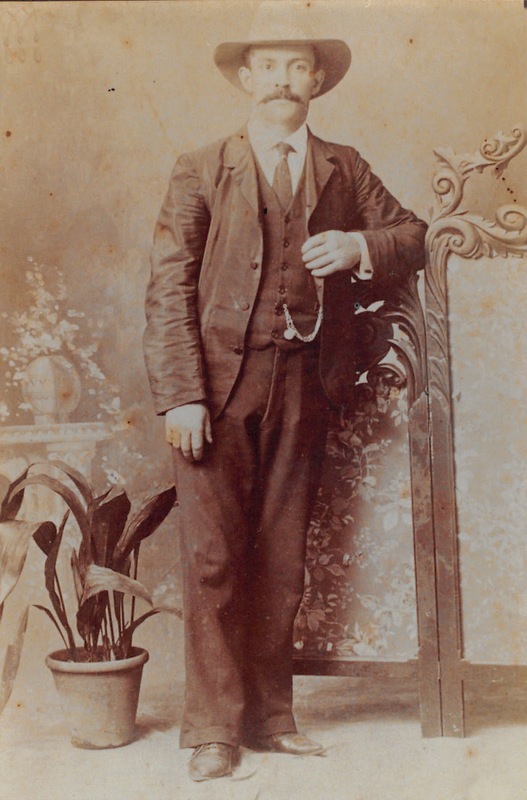 James Ernest Young (1878 – 1942), known as Ernest, was the youngest child of George Young (1826 – 1890) and Caroline Young née Clarke (1835 – 1879). 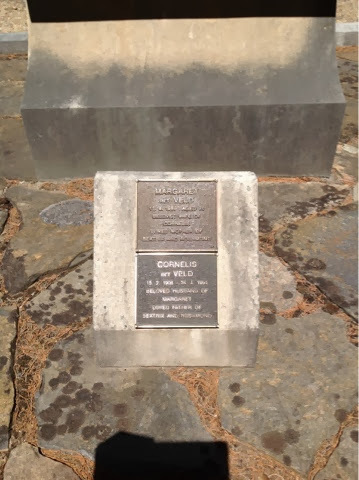 Ernest was born at Lamplough near Avoca, Victoria, on 28 November 1878. He was the youngest of 13 children. Five had died before he was born. Ernest’s father was a miner, aged 50, born in Liverpool. 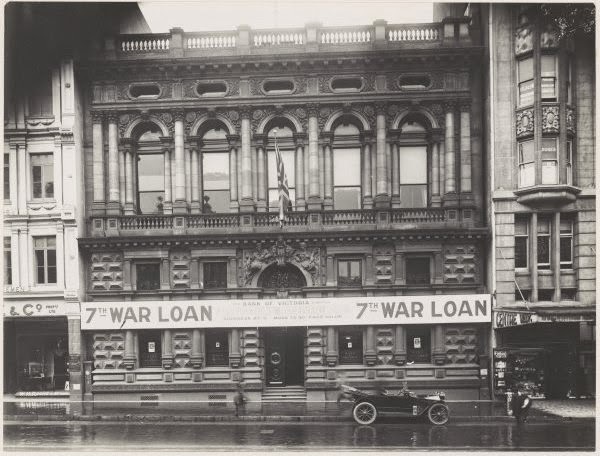 Caroline, his mother was aged 43 and her birthplace was given as Sydney (on the birth certificates of other children her birthplace had been given as Tumut, New South Wales). Caroline was the informant of the birth registration at Avoca on 19 December 1878. 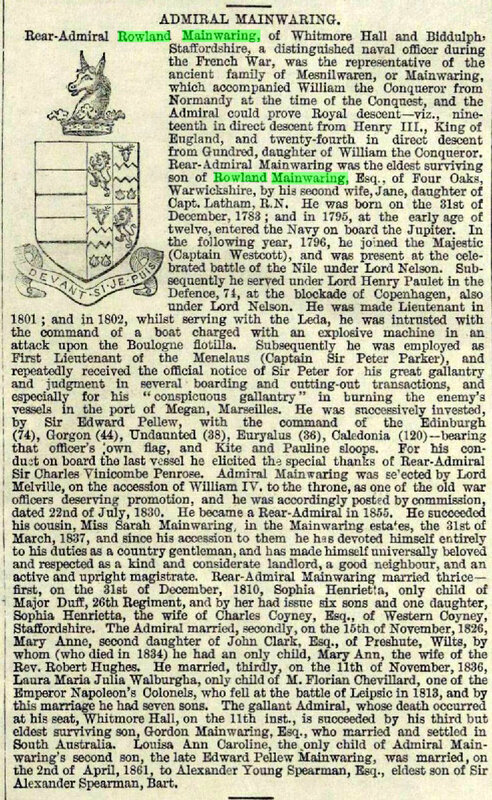 Ernest’s mother Caroline died a year later on 17 December 1879. George did not remarry. Ernest probably grew up at Lamplough, cared for by his father and his older brothers and sisters. Ernest’s first first wife was Mary Shea (1873 – 1920). They married in 1906 at Maryborough. On his marriage certificate he called himself Ernest. They had no children. In June 1917 Ernest was gassed, but was returned to the field. He later suffered various illnesses, some probably as a result of his gas injuries: German measles, scabies, myalgia, debility. He rejoined his unit in October 1918 and was promoted to Lance Corporal on 9 November 1918. 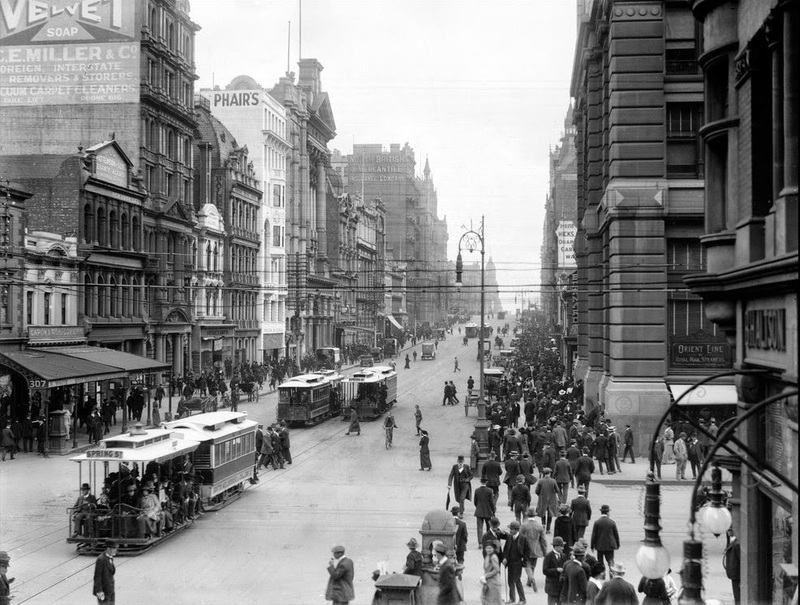 He returned to Australia in 1919 and was discharged in July 1919. Ernest’s wife Mary died on 20 December 1920. On 24 May 1921 Ernest remarried. His second wife was Emma Jane Jesson née Trewin (1880 – 1954), a divorcee. 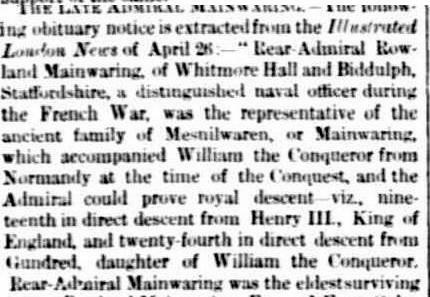 She had obtained a divorce in 1913 on the grounds of desertion from James Henry Jesson. Emma had custody of the three children from her first marriage. Ernest and Emma had a son, Ernest William George Young born 1922 who died 1993 leaving no children. Ernest died 5 January 1942 age 63 of chronic nephritis and heart failure. His occupation on his death certificate was retired builder. One of his death notices remembered all his brothers and sisters, even the infant George Young who had died in 1853, nearly 90 years earlier. 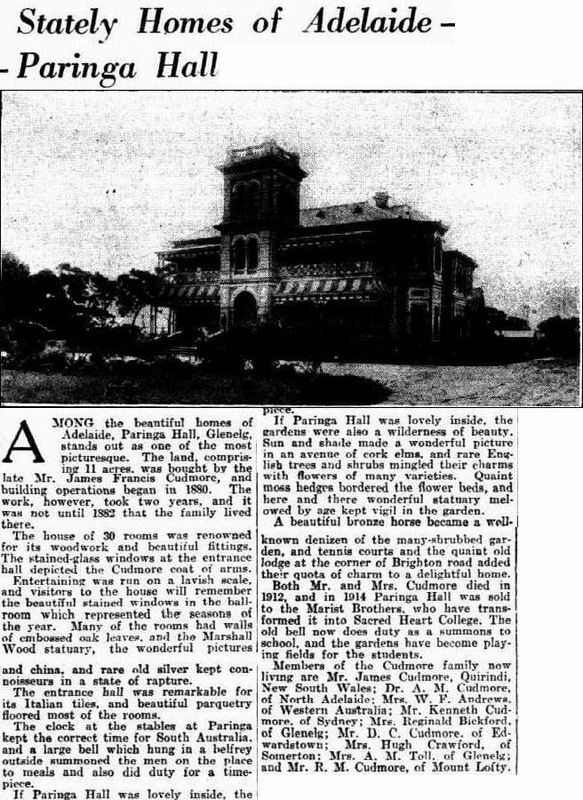 Paringa Hall at Somerton was the home of my great great grandparents James Francis Cudmore (1837 – 1912) and his wife Margaret née Budge (1845 – 1912). James and Margaret died within four months of each other in 1912. 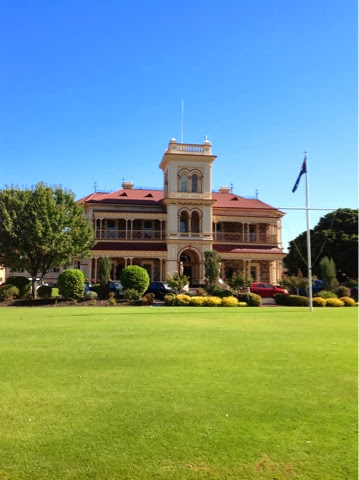 The house was sold to the Marist Brothers in 1914 and was converted to a school. I visited the school while on holiday last week in Adelaide and staff at the school made me very welcome. I was shown around the house which is very well cared for and much appreciated. They also gave me a booklet on the history of the house written in 1997 by their late archivist, Brother Columbanus Pratt, and the Friends of Paringa Hall. James and Margaret are buried in St Jude’s cemetery at Brighton. 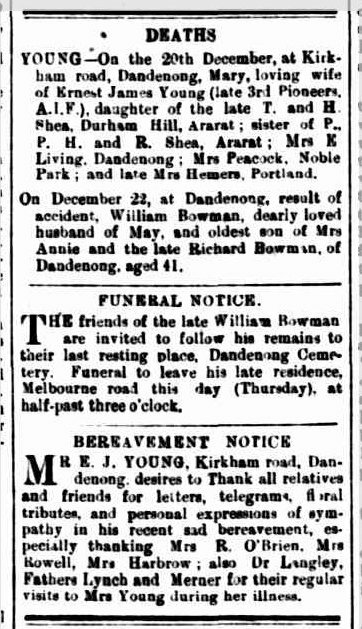 Obituary for my great grandmother, Beatrix Champion de Crespigny née Hughes (1884 – 1943), from The Advertiser of 12 November 1943 page 4. 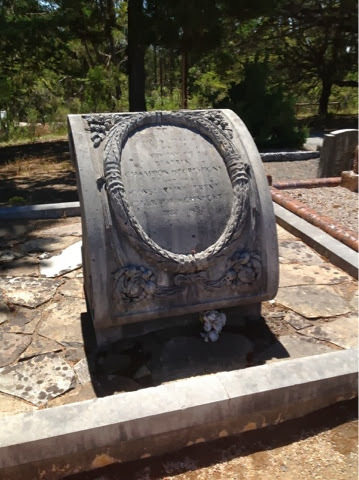 Yesterday I visited her grave at Stirling cemetery near Aldgate in the Adelaide Hills. I was very appreciative of a photograph with the grave location that I received from Gaye of the Adelaide Hills Council. Behind her grave are memorials to her daughter Margaret (1919 – 1989) and Margaret’s husband Cornelis In’t Veld (1908 – 1994). Beatrix’s gravestone is an unusual design. I would be very interested to hear of any similar designs. 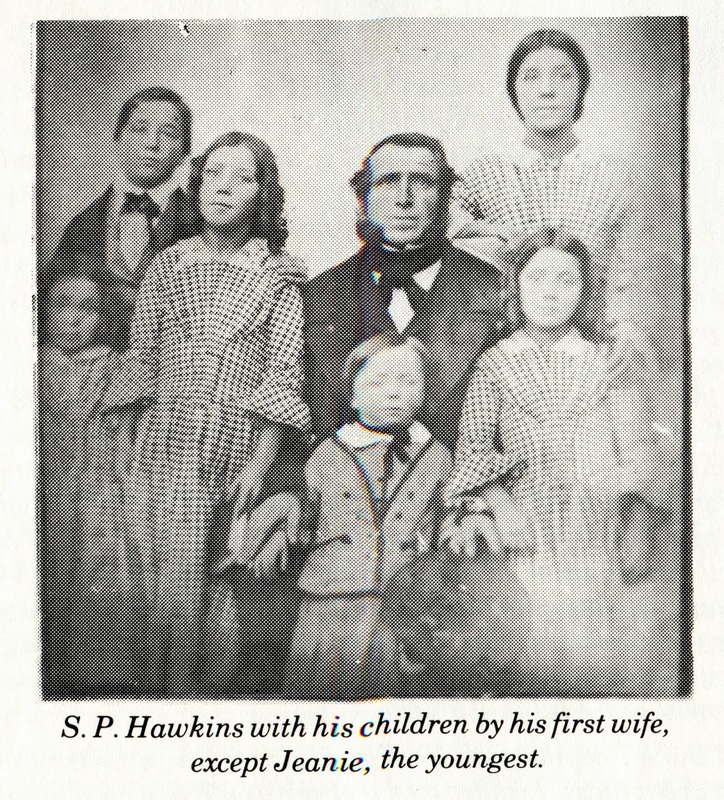 Samuel Proudfoot Hawkins (1819–1867), born on 30 April 1819 at Dumfries, Scotland to Robert Hawkins (1770–1841) and Penelope Hawkins née Carruthers (1765–1845), was my great great great grandfather. In 1841, within three years of Samuel’s arrival, an S.P. 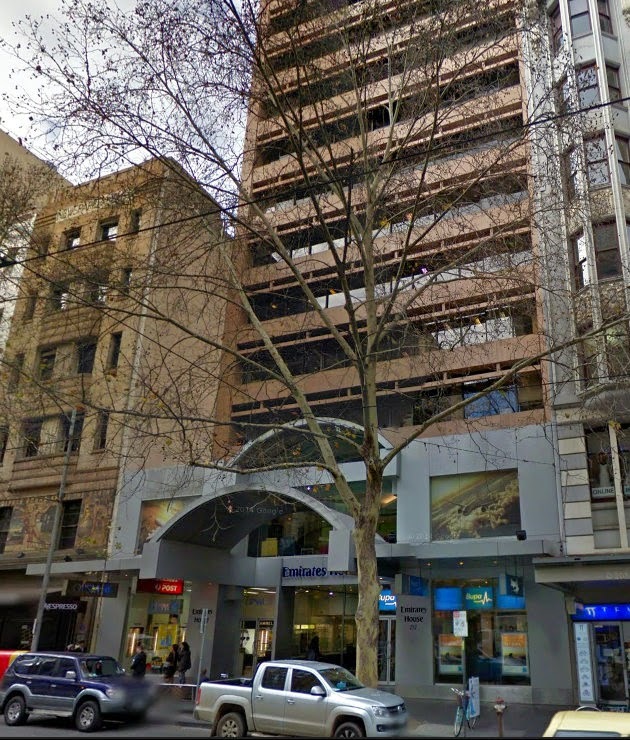 Hawkins is listed as a land surveyor, with offices in Lonsdale Street, in Kerr’s Melbourne Almanac and Port Phillip Directory. (http://members.optushome.com.au/lenorefrost/kerr.html ) He appears to have begun his land surveying career working for Robert Russell, the first surveyor of Melbourne. 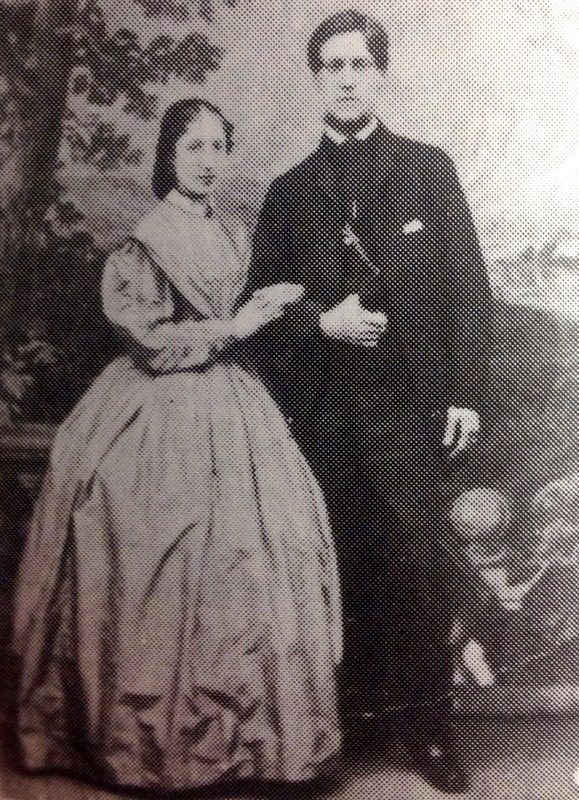 In 1849, at the age of thirty, Samuel married Jeanie Hutcheson (1824 – 1864). Jeanie’s three brothers had also settled in the Portland district. They had eight children. In 1864, after an illness of seventeen days, Jeanie died “disease of stomach and liver” and the complications of a miscarriage. She was 40 years old. Their children were aged from two to fifteen years. In 1865 Samuel married Mary Adamson (1843 – 1908), governess of his children. They had two children. The first died in infancy and the second was born on 23 July 1867, just over three months after Samuel’s death on 22 April 1867. 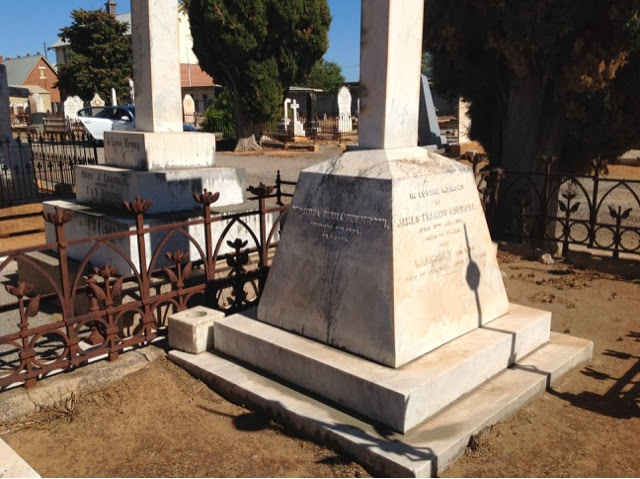 Samuel’s grave is in Portland North Cemetery, where he is buried with his first wife and their infant son Robert James Hawkins (1853-1854). His second wife died at Kyneton in 1908. 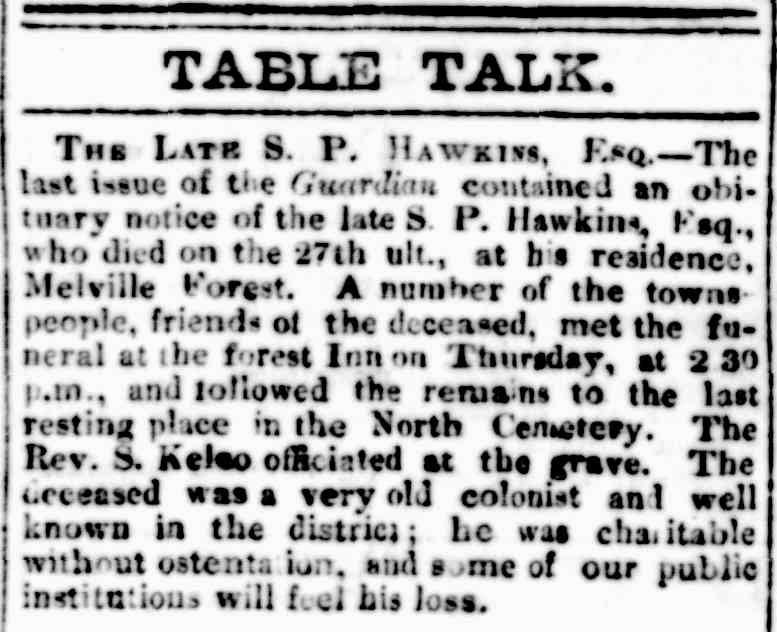 Probate was granted on the estate of Samuel Hawkins, Esquire of Melville Forest Station on 4 July 1867. His estate was estimated to be valued at £14,000. 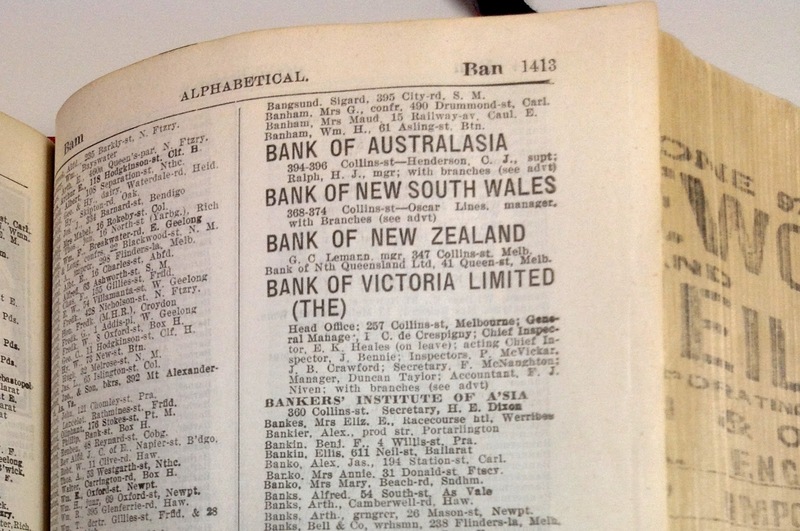 (Probate files held by Public Record Office of Victoria reference 6/328) Today the value of his estate is in the order of $2 million up to nearly $13 million; the lower value is based on the changes in the retail price index and the higher value on the changes in average earnings. (Using the conversion calculator at http://www.measuringworth.com which is based on shifts in purchasing power of British pounds). 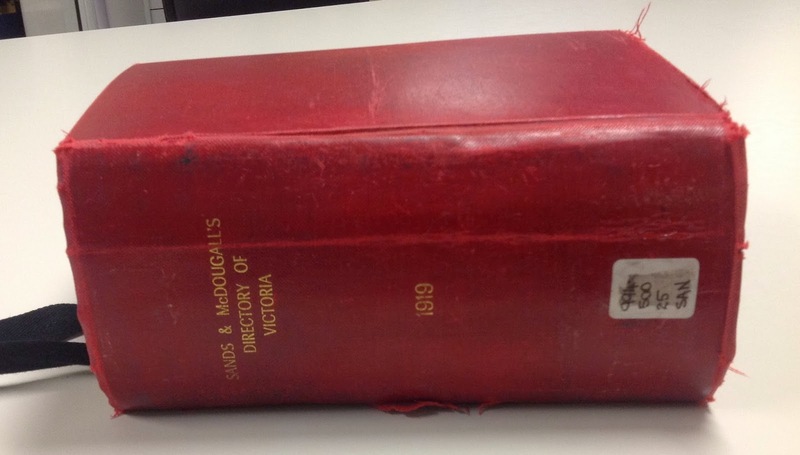 Although I had spent a long time looking for the death of Daniel Budge (1842 – 1895), the brother of my great great grandmother Margaret Cudmore née Budge, and had found a death index entry for him in Western Australia, I couldn’t be sure this was the right man. 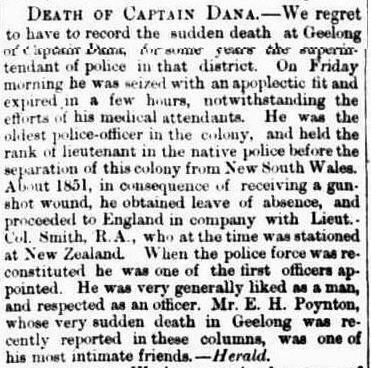 It wasn’t until I had searched the digitised newspapers on Trove that I learned how he died and why he was in Western Australia. It is with feelings of the deepest regret that we (Barcoo Independent,) learn of the death of Mr. Daniel Budge, who expired at Coolgardie on Sunday last of typhoid fever. 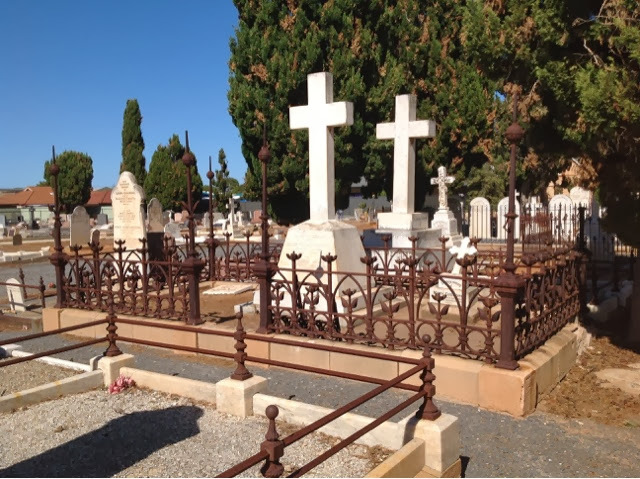 The deceased gentleman was well-known throughout the pastoral districts of Queensland, and to many of the older residents of the western portion of New South Wales, and was exceedingly and deservedly popular with all classes of the community. 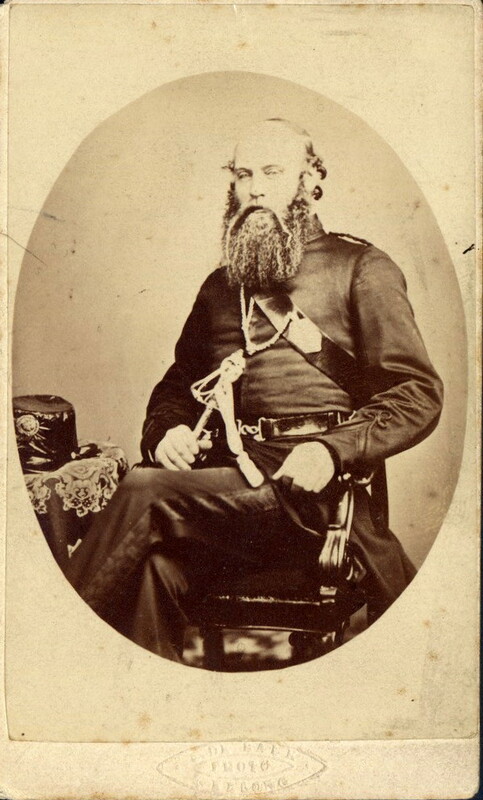 Born in Scotland in 1842, he accompanied his family to Adelaide, South Australia, in 1853. 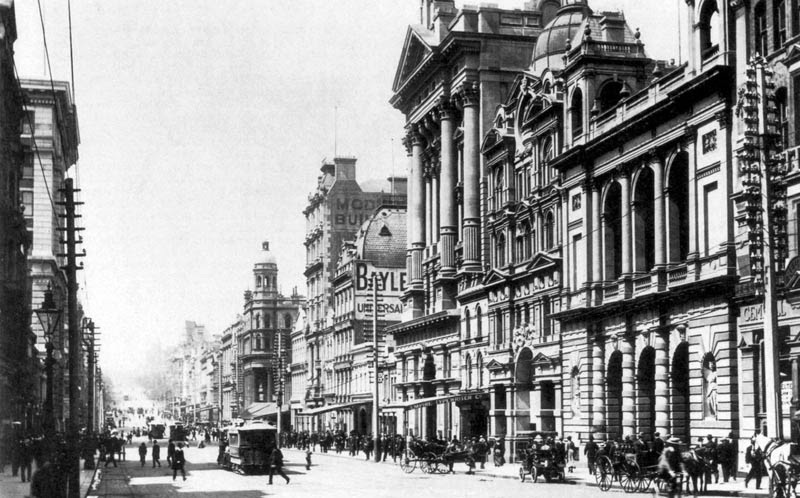 He adopted pastoral pursuits, and about 1862 was appointed manager of one of the Tolarno stations, on the Darling River, New South Wales. In 1875 he joined his brother, Mr. Kenneth Budge, an part owner of Gooyea Station, near Adavale, Queensland, where he remained until the death of his brother, after which the station was sold. In 1880 or 1881 he purchased Mr. A. Mossman’s share in Delta Station, baring for a partner Mr. W. P. Tozer, which station he managed for some years, during which Mr J. M. Niall bought Mr. Tozer’s share. About 1886 Messrs. R. Rarr-Smith and Co. bought Mr. Budge’s interest in that property, and the latter removed to Blackall, where he pur- chased the old Barcoo Hotel. This property he sold to Mr. R. Moss about 1888, and then entered into partnership with Mr. J. D. Hughes as auctioneers, stock and station agents, Blackall. 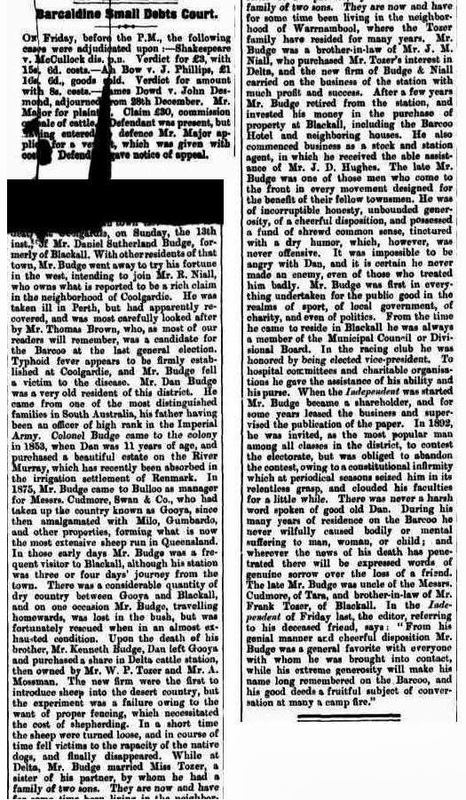 Mr. Budge was the lessee of this paper from April, 1891, to April, 1894, and in September, 1894, he left Blackall for Coolgardie, where he died. He took a great interest in local matters, more especially in the welfare of the local racing institutions. At various times he occupied the offices of alderman of the Blackall Municipality, chairman of the Kargoolnah Divisional Board, vice-president of the Blackall District Hospital, and vice-president of the Blackall Racing Club. From his genial manner and cheerful disposition he was a general favourite with everyone with whom he was brought into contact ; while his extreme generosity will make his name long remembered on the Barcoo, and his good deeds a fruitful subject of conversation at many a camp fire. Poor old Dan will be greatly missed, and many a long day will elapse before his name fades in the memory of a host of friends. 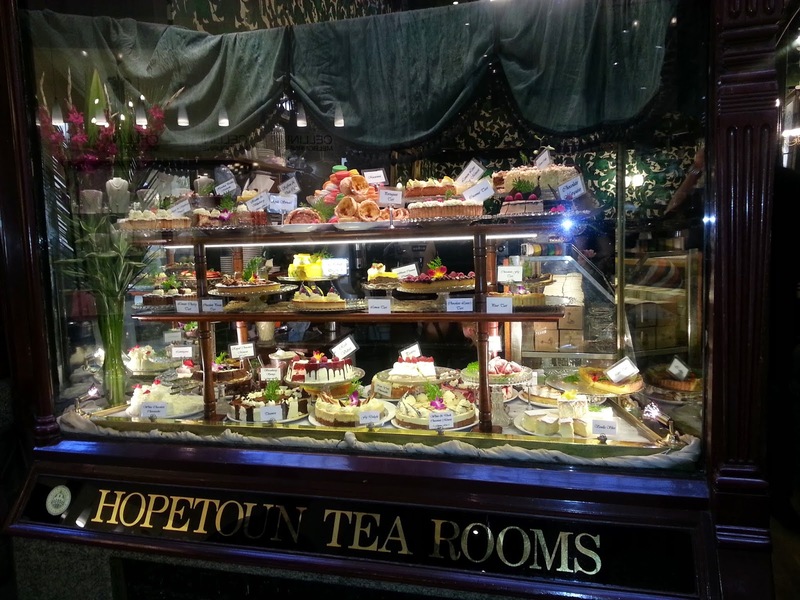 He leaves a wife and two children, who reside in Sydney. 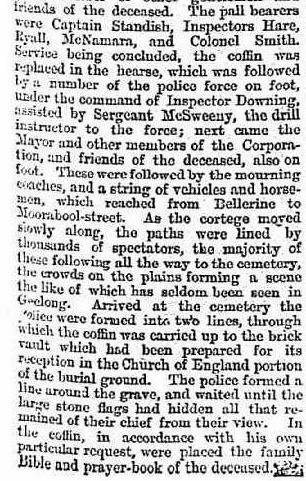 The obituary also appeared in Rockhampton’s Morning Bulletin of 24 January 1895. There is a longer obituary in The Western Champion and General Advertiser for the Central-Western Districts (Barcaldine, Qld. ), 22 January, page 9. 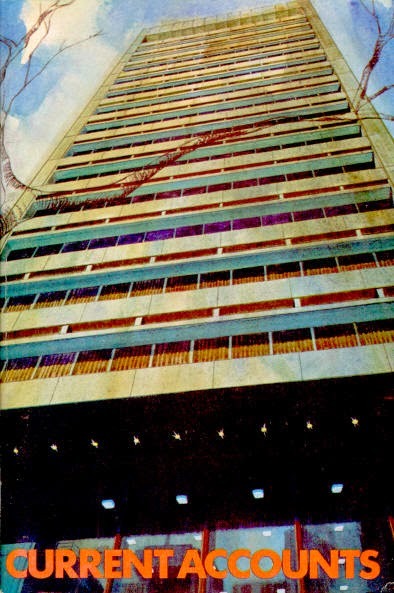 It mentions Daniel Budge’s connections with the Niall, Cudmore and Tozer families, his property dealings and his interest in local government and in horse-racing.